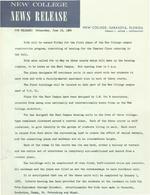 NEW COLLEGE NEWS RELEASE FOR RELEASE: Wednesday, Juae 10, 1964 NEW COllEGE, SARASOTA, FlORIDA FURMAN C. ARTHUR INFORMATION Bids will be opened Friday for the first phase of the New College campus construction program, consisting of housing for the Charter Class entering in the fall. Bids were called for in May on three courts which will make up the housing complex, to be known as the East Campus. Bid opening time is 4 p.m. The plans designate residence units in each court with two students in each room and with a faculty-master apartment also in each of three courts. The first buildings will be located on that part of the New College campus east of u.s. 41. Plans for the East Campus have been designed by I.M. Pei & Associates, selected from among nine nationally and internationally known firms as the New College architect. Pei has designed the East Campus housing units in the form of three village-type complexes clustered around a central plaza. Each of the three courts is self contained, to give identity to the groups of students living in each. Each court is raised five feet above the surrounding land to create the effect of varied terrain, and the connecting plaza and walkWays are at an intermediate height. Each of the rooms in the courts has its own bath, either a balcony or terrace and the entire set of structures is completely air-conditioned and heated from a central plant. The buildings will be constructed of oven fired, buff-colored brick and concrete. All walkways and the plaza are tiled as are the entranceways to each residence unit. It is anticipated that one of the three units will be completed by January 1, 1965. Interim housing has been provided for the students at the Landmark on Lido Key from September through December. Advertisements for bids were made in Sarasota, Bradenton, Tampa, St. Petersburg and Miami.